What Is DD Form 1172-2? DD Form 1172-2, Application for Identification Card/DEERS Enrollment is a form issued by the Department of Defense (DoD) and used for applying for a variety of Army identification cards, enrolling an individual into the Defense Enrollment Eligibility Reporting System (DEERS) database or when updating an existing DEERS record. The DD 1172-2 is often incorrectly referred to as the DD Form 1172 or DA Form 1172. 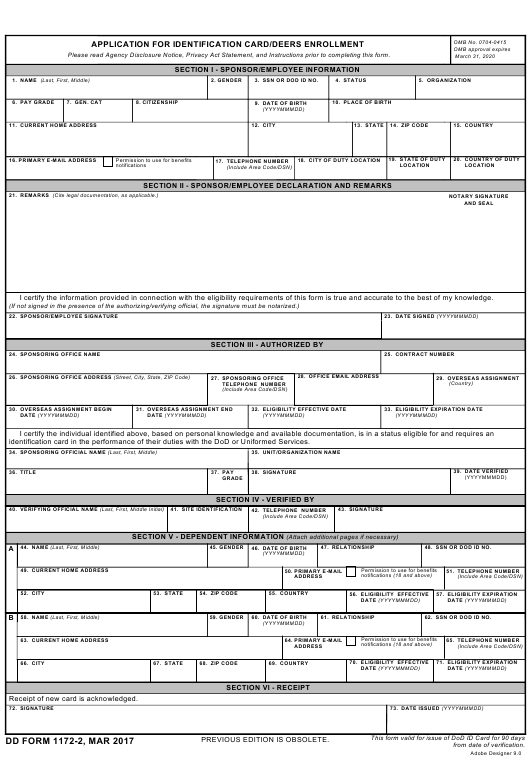 The application - sometimes called the DD 1172 DEERS Form - is used to request a DD Form 2, a DD Form 1173, a DD Form 1173-1, a DD Form 2764, a DD Form 2765, and a Common Access Card (CAC) for eligible individuals. The DD Form 1172-2 March 2017 version is up-to-date and in use today: all previous editions are obsolete and should not be used. A fillable version of the application can be acquired through the chain of command, downloaded from the DoD documentation website or down below. identification card in the performance of their duties with the DoD or Uniformed Services. 48. SSN OR DOD ID NO. 62. SSN OR DOD ID NO. RETURN COMPLETED FORM TO A REAL-TIME AUTOMATED PERSONNEL IDENTIFICATION SYSTEM WORK STATION. AUTHORITY: 10 U.S.C. Chapter 53, Miscellaneous Rights and Benefits; 10 U.S.C. Chapter 54, Commissary and Exchange Benefits; 50 U. Homeland Security Presidential Directive 12, Policy for a Common Identification Standard for Federal Employees and Contractors; and E.O. installations, buildings or facilities, and access to DoD computer systems and networks. Applicant information is subject to computer matching within the Department of Defense or with other Federal or non-Federal agencies. up to five years or both. The DD 1172-2 Form is divided into six sections. These sections provide information about the employee or sponsor, sponsoring agency and benefits eligibility. All the information being input must be valid and accurate. The penalty for false claims or statements is a fine of up to $10,000, a prison sentence of up to five years or both. Section I is filled by the applicant and contains personal identifying information including the name, social security number, gender, pay grade, status, and detailed contact information of the individual. Section II requires additional information regarding the current assignment and the benefits the individual is eligible for and is completed by the applicant or their department or agency. The third section contains all details and lists contact information regarding the applicant's sponsoring group or agency. This part provides details about the applicant's position and assignment and further information about the sponsoring official: their name, pay grade and title. The section is then signed by a qualified official for authorization. All personal and contact information about any dependents is listed in the fourth section of the DD 1172-2. The standard form allows listing of two individuals. The applicant must then acknowledge the receipt of their ID Card in Section V.
A copy of the DD Form 1172-2 must be kept on hand for further reference or to use when filing amended DD 1172-2 Forms in the future.